This entry was posted in Word 365 ProPlus Greek and tagged backstage view, File, General Options for Working with Word, Αλλαγή Μεγέθους Ή Περιστροφή Αντικειμένων, Γενικά, Γενικές Επιλογές Για Εργασία Με το Word, Επιλογές, Επιλογές Του Word, Ενημέρωση Περιεχομένου Εγγράφου Κατά την Μεταφορά Στο Word 365, Περιβάλλοντος Εργασίας Χρήστη, Τρόπος Μετακίνησης Του Εγγράφου Καθώς Πραγματοποιείται Μετακίνηση, Microsoft Office 365, Microsoft Word Options, Office System, Options, Resized or Rotated, Show How The Document Content Will Look As Objects Are Moved, Smart Office, Update Document Content While Dragging in Microsoft Word 365, User Interface Options, YouTube. This entry was posted in Word 365 ProPlus English and tagged backstage view, File, General Options for Working with Word, Microsoft Office 365, Microsoft Word Options, Office System, Options, Resized or Rotated, Show How The Document Content Will Look As Objects Are Moved, Smart Office, Update Document Content While Dragging in Microsoft Word 365, User Interface Options, YouTube. This entry was posted in Word 365 ProPlus Greek and tagged backstage view, Choose the Extensions you Want Word to Open by Default, E-Mail Attachment, How to Turn Off Reading View for Word 365 Attachments, Άνοιγμα Συνημμένων Ηλεκτρονικού Ταχυδρομεία και Άλλων Μη Επεξεργάσιμων Αρχείων Σε Προβολή Ανάγνωσης, Έγγραφο, Απενεργοποίηση Λειτουργίας Ανάγνωσης Για Συνημμένα Ηλεκτρονικού Ταχυδρομείου στο Word 365, Διάταξης Εκτύπωσης, Επιλέξτε Τις Επεκτάσεις Που Θέλετε Να Ανοίγουν Από Προεπιλογή Στο Word, Ειδοποίηση εάν το Microsoft Word δεν είναι το προεπιλεγμένο πρόγραμμα για την προβολή και επεξεργασία εγγράφων, Κατάσταση Λειτουργίας, Λειτουργία Ανάγνωσης, Μόνο Για Ανάγνωση, Να εμφανίζεται η οθόνη Έναρξης κατά την εκκίνηση της εφαρμογής, Συνημμένου, Layout Mode, Microsoft Office, Microsoft Word, Office Smart, Office System, Open E-Mail Attachments and Other Uneditable Files in Reading View, Option, Read-Only Mode, Show The Start Screen When This Applications Starts, Smart Office, Start Up Options, YouTube. We must select the File tab in order to move to Backstage View. Once in Backstage View, from the left, we select the command Options located at the bottom as shown in the image below. Once the Options command is selected, the Word Options dialog box appears as shown below. From the left of the Word Options dialog box, we make sure that the General area is activated. Then we scroll down in the middle of the window, where we locate the area named Start Up Options. Open E-Mail Attachments and Other Uneditable Files in Reading View (By selecting this command we can open E-Mail Attachments and other uneditable files in Reading View, meaning that Documents that we can’t edit such as attachments are opened in Reading View. If we deactivate this command, these Documents will open in the Default View). All we need to do is to activate or deactivate the check boxes at the left of the commands in order for them to take place or not. Once we have done the settings needed, we just press the Ok button located at the bottom right corner of the Microsoft Word Options dialog box, in order to return to our Document. 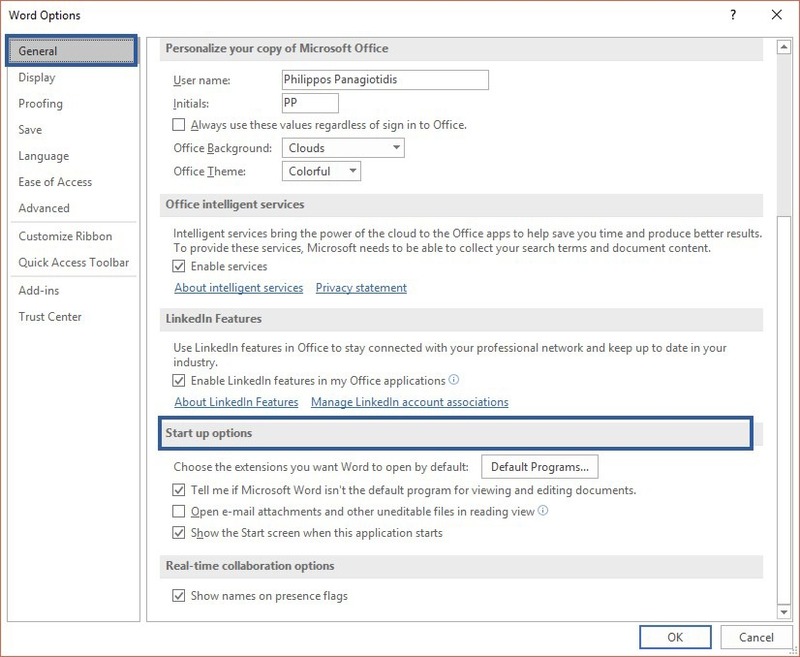 Below you can check out the video describing How To Turn Off Reading View for E-Mail Attachments in Word 365. This entry was posted in Word 365 ProPlus English and tagged backstage view, Choose the Extensions you Want Word to Open by Default, E-Mail Attachment, How to Turn Off Reading View for Word 365 Attachments, Layout Mode, Microsoft Office, Microsoft Word, Office Smart, Office System, Open E-Mail Attachments and Other Uneditable Files in Reading View, Option, Read-Only Mode, Show The Start Screen When This Applications Starts, Smart Office, Start Up Options, YouTube. This entry was posted in Word 365 ProPlus Greek and tagged Account, Excel, Άνοιγμα, Έναρξη, Αρχική, Ανανεωμένη Οθόνης Έναρξης Στο Office 365, Δημιουργία, Επιλογές, Λογαριασμός, Οθόνες, Σχόλια, Microsoft, Microsoft Office 365, New Start Screens for Office 365 Applications, Office Smart, Office System, Open, Options, philippospan, PowerPoint, Smart Office, Subscribe, Word, YouTube Channel. This entry was posted in Word 365 ProPlus English and tagged Account, Excel, Microsoft, Microsoft Office 365, New Start Screens for Office 365 Applications, Office Smart, Office System, Open, Options, philippospan, PowerPoint, Smart Office, Subscribe, Word, YouTube Channel. This entry was posted in Word 365 ProPlus Greek and tagged Advanced Properties, Author, Comments, Contents, Created, Custom, Fields, Info, Αρχείο, Διευθυντής, Επεξεργασίας, Ετικέτες, Ιδιότητες, Μέγεθος, Προβολή, Προβολή ή Αλλαγή Ιδιοτήτων Ενός Αρχείου, Προβολή ή Τροποποίηση Ιδιοτήτων Αρχείου Στο Office 365, Πεδία Ιδιοτήτων, Στατιστικά, Συντάκτης, Συνολικός Χρόνος, Σχόλια, Σχετικά Άτομα, Σύνθετες Ιδιότητες, Σύνοψη, Σελίδες, Τίτλος, Last Modified, Last Printed, Microsoft Office 365, Microsoft Word 365, Office Smart, Office System, Open File Locations, Page, Properties, Properties Fields, Related People, See More Document Properties, Size, Smart Office, Statistics, Subscribe, Summary, Tags, Title, Total Editing Time, View, View Or Change The Properties For An Office File, Words, YouTube Channel.